On May 2, 1968, Anastasio Hernández-Rojas was born in San Luis Potosi, Mexico. At the age of 15, he moved north, to San Diego, to find work and send money home. At 21, he met Maria Puga. Over the next 20 years, the couple had five children, all born in San Diego. The eldest was born in 1990. The youngest, twins, were born in 2006. Anastasio Hernández-Rojas worked in construction and demolition, until the housing market crashed. On May 10, 2010, Anastasio Hernández-Rojas was arrested for shoplifting groceries. On May 24, he was deported. On May 28, he and his brother tried to re-enter the United States. They were detained at the border. 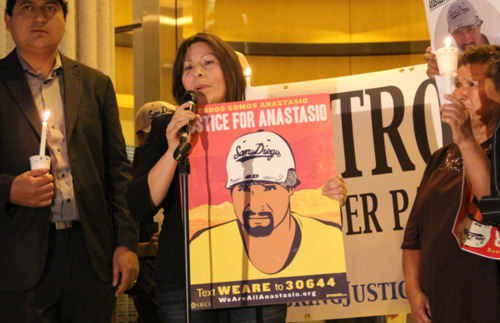 Then Anastasio Hernández-Rojas was brutally murdered by Custom and Border “Protection” officers. The San Diego coroner determined that Anastasio Hernández-Rojas’ death was a homicide. The State tried to have Anastasio Hernández-Rojas’s story end there, just another `unfortunate incident’ in the borderlands, but Maria Puga began a mighty campaign demanding justice for her husband, her children, herself, and all who migrate across the borderlands. Seven years later, Maria Puga’s campaign continues. 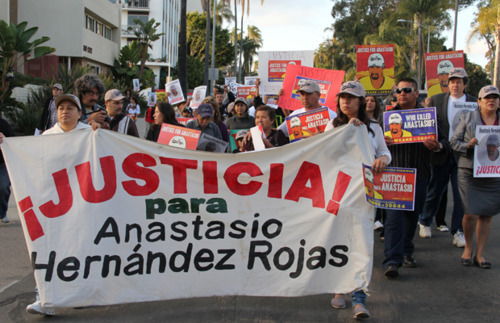 Anastasio Hernández-Rojas was murdered in the open, in front of witnesses, and cameras. Otherwise, we would never know his story. We would not know that Anastasio Hernández-Rojas was tortured for an extended period, during which he howled and begged for help. We would not know the depth and extent of viciousness and cruelty that passes for “protection” on the United States southern border. But we do know. We know because Maria Puga said NO to silence. She pressed for information and pushed for answers. At each step, she was stonewalled. Nothing came of the review. Maria Puga is Anastasio Hernández-Rojas’s widow. She is part of the Borderland of Widows, produced by State policy of militarized and securitized borders. Militarized borders mass produce widows. That’s their goal. From Australia to England to the European Union to the United States, militarized, securitized borders create borderlands in which largely poor women of color are deemed to be so much detritus. The living dead of the new world order, widows are meant to wrap themselves in mourning, slink off into the shadows, whimper for a bit, and die. Maria Puga said, “No, justice must be served.” The struggle continues. The widows demand justice. Tomorrow, June 23, is International Widows Day. Around the world, widows are denied justice. They are dropped from social networks, they are forgotten, they are denied access to property, they are circled in by various `cultural’ and legal restrictions. Around the world. This is not about `the developing world’. It’s global. Rio + 20 ends today. Many who care about the environment, in whatever way, are frustrated by the lack of meaningful action. Women and women’s advocates, in particular, object to the absolute failure of the conference to understand as fundamental the link between family planning and environmental justice. Family planning covers the entire arc of family history, from before cradle to the grave … or at least it should. Did you hear any major discussion in Rio about widows’ rights? Me neither. What about at the G20 meeting in Mexico City this past week? No? Neither did I. How will widows figure into the family planning summit conference in London, in July? Wait and see. Widows around the world are of all ages, and they share more than grief. They share reduced access to means of survival and well being. Some are workplace widows, such as Shelly Anderson, Rhonda Burkeen, Sheila Clark, Nancy Curtis, Michelle Jones, Courtney Kemp, Tracy Kleppinger, Sherri Revette, Natalie Roshto, whose respective partners were killed in the Deepwater Horizon rig explosion, Have they received proper compensation? No. Do the widows of mining disasters receive proper compensation for their loss? Seldom. Nanda Bhandare’s husband was a cotton farmer. Debts rose, Indian small farmers faced multinational agro-corporations and a hostile global market, bankruptcy and starvation loomed larger and larger. One day, Bhandare’s husband protested with his life. He drank enough pesticide to kill himself. He died, but his debts live on. Years later, his widow has taken the children out of school to work the fields to pay those debts. Each day, they move closer to death by starvation. Where is Nanda Bhandare in the global conference circuitry? Nowhere. Around the world, widows are initially acknowledged and supported, especially after a catastrophe such as the recent airline crash in Nigeria. What happens next? Too often they are abandoned. Individuals, communities, agencies move on, feeling they have done their due diligence. They haven’t. We haven’t..
Around the world widows are organizing. In the Cross River State, in Nigeria, widows and their supporters are talking about what is needed: enhanced livelihood options through access to real education and equitable finance; increased cooperation among widows and widows-focused organisations through the formation of widows cooperatives and networks; increased public awareness on widowhood issues through information, education and communication; and, finally, enabling a policy environment for widows through an advocacy campaign. In Nigeria, as almost everywhere, the condition of widows is lamentable, but it is not inevitable. In Sierra Leone, for example, more than 20% of households are headed by women. Over a third of the women who are heads of households are widows. Women, like Gladys Brima, the founder of Women’s Partnership for Justice and Peace, are advocating, organizing, pushing. Women like Sia Bona are staking their lives on organizing. When Bona’s husband died, her in laws swooped in and pushed her and her mother off the farm, a farm that had been Bona’s father’s farm. The law says one thing, customary and traditional law says another. 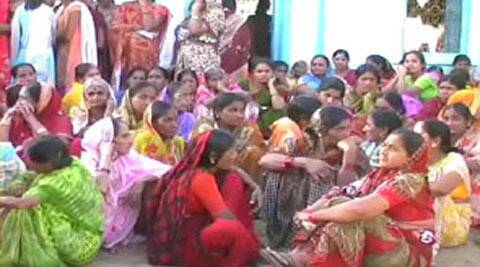 Women, and especially rural women, don’t live in `the State’. They live where they live, locally. Federal or national laws without built in requirements for local transformation are, at best, empty symbols. More often than not, they are tools of oppression, exclusion, and betrayal. Bona, Brima and other women in Sierra Leone are organizing at all levels to change that situation … now. A version of that exclusion takes place almost everywhere. Widows must have more than a seat at the conference table. They must be prioritized, not just recognized. Thus far, they are not. Instead, widows haunt the discussion of global and of local justice. And they are organizing.